NFL Week 11 Fantasy QB Breakdown: Is Cam Newton Too Risky vs. Lions? In this positional breakdown, I’m looking at the quarterbacks at the top of the individual Pro Models that Jonathan Bales, Peter Jennings (CSURAM88), Adam Levitan, Sean Koerner, Chris Raybon, Kevin McClelland (SportsGeek) and I have constructed. This week, there are four quarterbacks at the top of our individual Pro Models. UPDATE (11/18): Wide receiver Torrey Smith (knee) will miss his fourth straight game. Lions defensive tackle A’Shawn Robinson (ankle) is out. Defensive tackle Damon Harrison (shoulder) and edge rusher Ezekiel Ansah (shoulder) are both questionable. 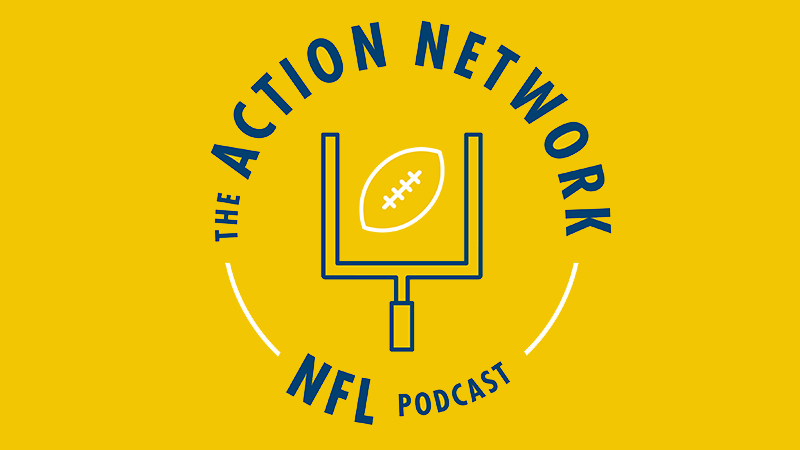 On the Wednesday edition of The Action Network NFL Podcast, guest Ian Hartitz expressed concern about Newton, who has the slate’s second-worst pace-based matchup and is facing a Lions defense holding quarterbacks to a league-low 55 yards rushing for the season. Even so, Newton is still popping in a number of our Models. Newton has the players around him to succeed. 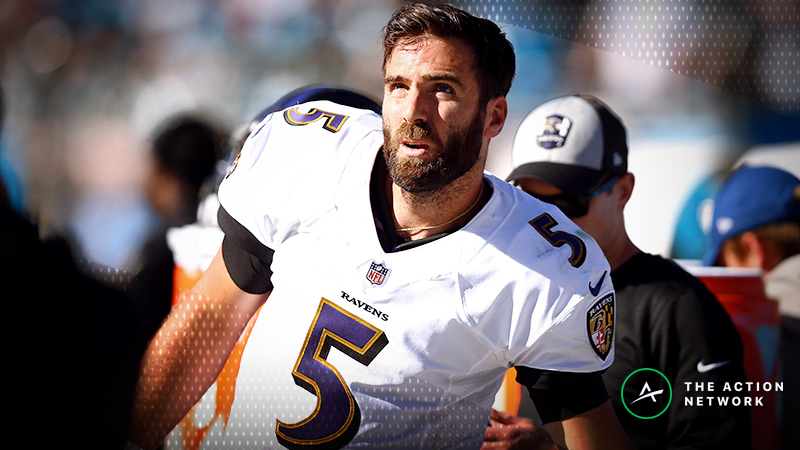 In his five healthy seasons, he’s been a top-four fantasy quarterback. He’s coming off his worst game of the season, a 52-21 Thursday Night Football loss in which he passed for just 193 yards and rushed for 10. But he’s in a good bounce back spot this week, and even with his Week 10 letdown against the Steelers, Newton has had fewer than 18 DraftKings points in a game this season just once. Credit: Bob Donnan-USA TODAY Sports. Pictured: Carolina Panthers quarterback Cam Newton. Unsurprisingly, a large portion of Newton’s value comes from his rushing production. On a per-game basis, he leads all quarterbacks with 5.0 expected fantasy points as a runner (per the RotoViz Screener). Tied for first on the team with four rushing touchdowns and second with 75 carries and 352 yards on the ground, Newton is basically his own short-yardage back. He’s first among all quarterbacks in league history with 58 rushing touchdowns and second to only Michael Vick with 39.6 yards rushing per game. Newton is viable in almost any game environment because of his running ability. And Newton has a good matchup this week against the Lions. Under first-year head coach Matt Patricia, the Lions are 31st in pass defense with a 37.4% mark in Football Outsiders’ DVOA. In fact, the Lions are bottom-six in pass defense against almost every position. Unsurprisingly, the Lions have the league’s second-worst Pro Football Focus coverage grade at 48.1. Additionally, All-Pro cornerback Darius Slay (knee) missed Week 10 and is questionable to play. If he’s inactive, the Lions will be extremely vulnerable. Last week, in their first game of the season without him, the Lions gave up a slate-high 39.0 DraftKings points to Bears quarterback Mitchell Trubisky, who had a 355-3-0 passing line with a 76.7% completion rate. And even if Slay does play, the Lions are exploitable. No. 2 cornerback Nevin Lawson has a subpar 50.3 PFF coverage grade, and since the Week 6 bye he’s allowed a 70.6% completion rate and 12-149-3 passing line on 118 coverage snaps. The Lions have experimented with cornerback Teez Tabor as a starter, but he’s literally last among all corners with his 28.8 PFF coverage grade. In Week 10 the team gave the veteran DeShawn Shead his first start of the season, but he’s never had a PFF coverage grade of even 64 for a season, and Trubisky opportunistically attacked him, targeting his coverage five times for a 4-104-1 passing line. No matter who the Lions start at corner, they struggle. Newton’s on the road, which is theoretically less than ideal, but he’s been a splits-agnostic player throughout his career (per the RotoViz Game Splits App). But against bottom-six pass defenses, Newton has been strong, especially as a favorite. After throwing for just 161 yards and zero scores in Week 1, Newton has passed for multiple touchdowns in each game. The Panthers trail only the Saints on the slate with their 27.25-point implied Vegas total. 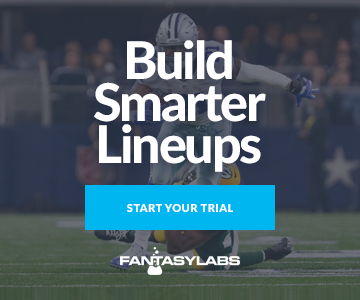 If you roster Newton in guaranteed prize pools, you might want to use our Lineup Builder to stack Newton with Olsen, who has been Newton’s top target for years and is tied for the team lead with three receiving touchdowns since returning to action in Week 6. Since 2014, NFL quarterbacks on average have had a 0.47 correlation with their No. 1 tight ends. With Olsen, Newton has a 0.84 correlation. On Sunday morning, I might look to bet the over on Newton’s rushing yardage prop, just depending on the line. The Lions have limited quarterback rushing, but Newton is one of the best running quarterbacks of all time, and only once this year has Newton had fewer than five rush attempts. To find the best bets in the props market, use our Player Props Tool, which is powered by our industry-leading projections. Since Week 1, the props with a bet quality of 10 have gone 179-89-6, good for a 65% win rate. Newton has position-high median and ceiling projections in our Models, and he looks like an especially strong option on DraftKings, where he leads all passers with his 99% Bargain Rating, is tied for first with 10 Pro Trends and distinguishes himself as the No. 1 quarterback in the Bales, CUSRAM88, Raybon and Freedman Models. For good measure, he’s also the top option on FanDuel in the Bales, Raybon and SportsGeek Models. UPDATE (11/18): Right tackle Marcus Gilbert (knee) will miss his fourth straight game. That Roethlisberger is at the top of some of our Models — even though he is on the road and facing the Jaguars — highlights the extent to which DraftKings this year has downgraded players in disadvantageous situations. Big Ben is popping in our Models not because he’s in a great spot but because he is having a great season and yet is priced outside of the top six at his position this week. Coming off a triumphant 52-21 Thursday Night Football smackdown of the Panthers, Roethlisberger and the Steelers are in fine form. After starting 1-2-1, the Steelers have won five straight games, and Roethlisberger in Week 10 had perhaps his best performance of the season, racking up 38.8 DraftKings points on 328-5-0 passing and 3-27-0 rushing. Completing 88% of his passes, Roethlisberger had a perfect 158.3 passer rating for the game. The Steelers were so dominant that Roethlisberger took just one snap in the fourth quarter before giving way to backup Joshua Dobbs. And now, for the third time in 13 months, the Steelers will face the Jaguars — and Roethlisberger must have revenge on his mind. Last year, the Steelers suffered an eye-opening 30-9 Week 5 home loss to the upstart Jags as Roethlisberger passed for 312 yards but tossed five interceptions and killed any chances the Steelers had of winning the game. With 10.6 DraftKings points, Roethlisberger easily had his worst game of 2017 against the Jags. And yet against them he also had his best game of the year, putting up 41.4 DraftKings points thanks to a 469-yard, five-touchdown passing effort that still ended in a 45-42 divisional round defeat at home. But now he is on the road — and we have no way of knowing which version of the quarterback will show up for this game. Discounting backups and players yet to start 16 games, Roethlisberger has a league-worst -2.68 DraftKings Plus/Minus on the road since 2014. Big Ben is not just a below-average quarterback on the road. He transforms into the Bizarro version of himself: Big Bust. Roethlisberger’s 35.3% Consistency Rating on the road is downright terrifying. Under no circumstances should he be rostered in cash games. He’s a GPP-only play, especially because of his matchup. Photo Credit: Philip G. Pavely-USA TODAY Sports. Pictured: Ben Roethlisberger. The Jags aren’t as imposing as they were last year — they’ve lost five straight games and rank 15th in pass defense (1.8% DVOA) — but cornerback A.J. Bouye (calf) has been cleared to return to practice, so he’s likely to play this week after missing the past two games. Since last season, All-Pro cornerback Jalen Ramsey has allowed 100 yards in his coverage in just two games — and both of those came against the Steelers, who have been unafraid to throw at him — but this year he’s still holding passers to a completion rate of 53.3%, which is very much in line with his numbers from 2016 (52.9%) and 2017 (53.8%), and he’s allowed just one touchdown. The Jags are still very much not a defense to target. Last year, they held quarterbacks to a league-low 12.4 DraftKings points per game. This year, they’re holding opposing passers to a bottom-six mark of 17.3. On the one hand, their passing defense is allowing quarterbacks to score an extra 4.9 points per game. On the other hand, they’re yet to allow 30 DraftKings points to a passer this year, and they’ve managed to hold the five best quarterbacks they’ve faced (Patrick Mahomes, Andrew Luck, Deshaun Watson, Carson Wentz and Tom Brady) to an average of 19.4 DraftKings points per game. And there’s one more cause for concern: The connection between Roethlisberger and Brown has been noticeably off this year. Over the four previous seasons, Roethlisberger had a stellar 9.3 AY/A on his 643 passes directed to Brown. That combination of volume and efficiency is otherworldly. This year, though, of any Steelers pass-catcher targeted at least 25 times by Roethlisberger, Brown has by far seen the least efficient targets. It’s hard to say with whom the blame lies for Big Ben’s embarrassing 2018 AY/A on Brown’s targets. Maybe Roethlisberger is becoming more inaccurate as he ages. Or maybe Brown is slowing down. Either way, Big Ben’s diminished efficiency on passes to Brown clearly doesn’t bode well for his fantasy prospects. In the All-Pro Antonio era, Steelers road games have a 10-26 over/under record, which is good for a 41.8% return on investment for under bettors (per Bet Labs). In fact, the Steelers have been the most profitable road team for under bettors in that time. Not once over that span has the Steelers road under not had a winning season. We shouldn’t expect this game to be a high-scoring affair. On top of that, the Steelers are the most overrated Week 11 team, at least according to The Action Network Power Rankings. Even so, Roethlisberger warrants GPP consideration. Roethlisberger will have low ownership. Steelers stacks will have even lower ownership. Roethlisberger averaged 390.5 yards passing per game against the Jags last year. He’s second in the league with 320.9 yards passing per game this year. The Steelers have had extra time to prepare for this game because they played on TNF last week. Even on the road and with this matchup, Big Ben still has 400-yard, four-touchdown upside. Roethlisberger is the No. 1 DraftKings quarterback in the Levitan, Koerner and SportsGeek Models. Although Stafford missed more than half of his first two seasons to injury and was plagued by inconsistency early in his career, since 2011 he’s been a locked-in, stats-chasing, gunslinging, yardage accumulator: Over the last seven-plus years, only Saints quarterback Drew Brees and Falcons quarterback Matt Ryan have more than Stafford’s 34,332 yards passing. And Stafford has been especially sharp since 2014, when offensive coordinator (then quarterbacks coach) Jim Bob Cooter joined the team. Of course, also joining the team in 2014 was wide receiver Golden Tate, who has been Stafford’s most dependable pass-catching option since then — and now he’s gone. We shouldn’t put too much weight on how Stafford has done in his two games since Tate was traded to the Eagles, but the early per-game splits for don’t look good. In his four full seasons in Detroit, Tate averaged 93 receptions and 1,056 yards receiving per year, and through Week 8 he was pacing to finish the season with 100.6 receptions and 1,181.7 yards. It’s naïve to expect Stafford not to suffer without Tate, especially since he’s exhibited little chemistry with replacements T.J. Jones (3-25-0 on four targets) and Brandon Powell (1-6-0 on three targets) since the Tate trade. Credit: Raj Mehta-USA TODAY Sports. Pictured: Detroit Lions quarterback Matthew Stafford (9). And Stafford might suffer all the more this week because of the injuries around him. No. 1 wide receiver Marvin Jones (knee) exited Week 10 early with an injury. He’s reportedly dealing with a bone bruise and could sit in Week 11, especially since the Lions will play with short rest on Thanksgiving in Week 12. Jones is top-five in the league with 12 end-zone targets. His absence I’m sure would cause us to downgrade Stafford in our rankings and projections. On top of that, tight ends Michael Roberts (shoulder) and Luke Willson (shoulder) and right guard T.J. Lang (neck) are questionable. Still, Stafford has a high-upside wide receiver in Kenny Golladay and a strong pass-catching running back in Theo Riddick, and the Panthers have allowed a top-five mark of 21.7 FanDuel points per game to opposing quarterbacks. Not one defensive back in the team’s nickel package has a PFF coverage grade of even 65. The Panthers have frequently used their corners to shadow wide receivers this year, and it’s possible that Donte Jackson and James Bradberry will respectively tail M. Jones and Galloday, both of whom are capable of winning those matchups. Jackson is a second-rounder with good athleticism (4.32-second 40 time), but he’s a rookie who’s allowed a 68.0% completion rate and 34-420-3 receiving line on 363 coverage snaps. As for Bradberry, he’s been wildly inconsistent, holding Buccaneers wide receiver Mike Evans to a 1-16-0 stat line on seven targets in Week 9 but allowing quarterbacks to tag him with a 15-229-3 line on 20 attempts in Weeks 7-8 & 10. In the Cooter era, Stafford has been notably better at home than on the road. And within the Cooter era, never has Stafford at home been as cheap on FanDuel as he is this week. Remember, that’s a span of time stretching all the way back to 2014. Stafford has a position-high 55% Bargain Rating on FanDuel, where he’s the No. 1 quarterback in the CSURAM88, Levitan and Koerner Models. Manning has spent much of the past three seasons auditioning for “The Walking Dead.” He’s completed 67.6% of his passes this year, but he’s been downright unwatchable for most of his games, and even though the Giants have already had their bye, Manning still leads the league with 32 sacks taken. But this week Manning faces the Bucs, so he’s at least in the GPP-only conversation. The Bucs are 30th in pass defense (36.0% DVOA) and have allowed a top-four mark of 24.2 FanDuel points per game to opposing quarterbacks. They have allowed 300 yards and/or multiple touchdowns to every passer they’ve faced except for Redskins quarterback Alex Smith, who has proven himself to be a rather points-averse player this year. For context: The Giants are 2-7. They have a scoring differential of -51 points. They are 26th in scoring with 19.7 points per game. Coming out of the bye in Week 10, there was a real possibility that they would bench their longtime franchise quarterback. And now they are facing the offense that leads the league with 3,251 passing yards. Credit: Brad Penner-USA TODAY Sports. Pictured: New York Giants quarterback Eli Manning (10). Even with all of that, the Giants are favored. That’s how bad the Bucs defense is. And to make matters worse, Tampa’s defense is the walking wounded. In the front seven, edge rusher Vinny Curry (ankle) has missed three of the past four games and is yet to practice this week. Defensive end Carl Nassib (elbow) suffered an injury in Week 10 and is uncertain to play. Middle linebacker Kwon Alexander (knee, IR) is out, as is backup middle linebacker Jack Cichy (ankle, IR). On top of that, weakside linebacker Lavonte David (knee) is dealing with a sprain and tentatively expected not to play. 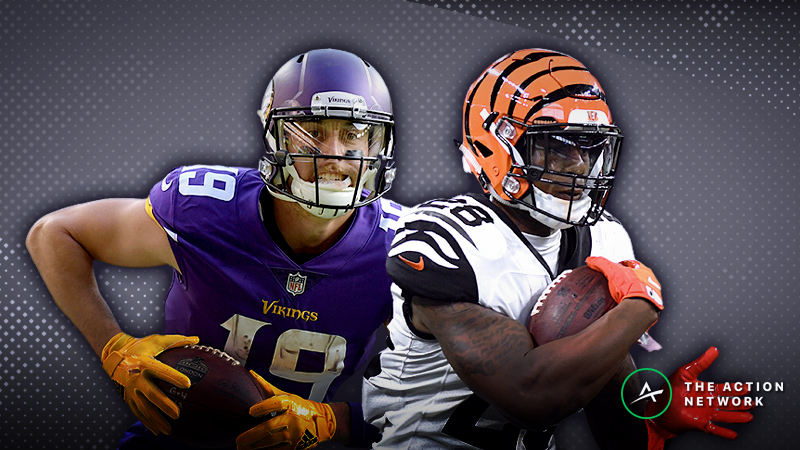 Manning has 300 yards or three touchdowns passing in four of the past five games, and he has one of the league’s best assemblages of pass-catching players around him with wide receivers Odell Beckham Jr. and Sterling Shepard, running back Saquon Barkley and tight end Evan Engram. Never with Beckham in the lineup has Manning been cheaper as a home favorite than he is this week on FanDuel, where he’s (somewhat embarrassingly) the No. 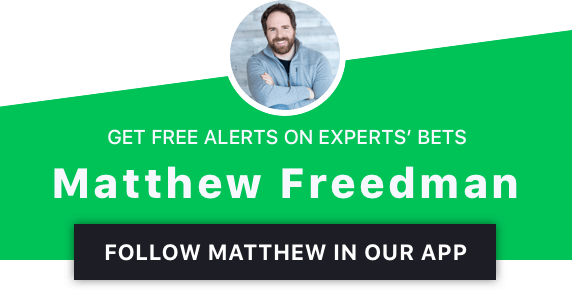 1 quarterback in the Freedman Model.